Today I heard someone say “I hope we’re not playing with fire” in regard to making budget reduction proposals. I’m not even sure the complete context of what they were saying, but hearing this phrase in the scope of what is going on in our economic forecast gave me reason to pause. It does feel a bit like playing with fire. There seems to be something dangerous and somewhat precarious about the state we are in. 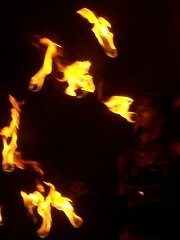 I do believe that fire can purify and transform, at least symbolically. This is a way that I think about what we are going through right now. When I read Helene Blowers’ post about new beginnings I felt a like mind chiming in. I think that many of our current practices or approaches may have to burn up in the proverbial fire that has been cast. Sincere vision and dreams will be burnished, but not destroyed.